Many people who don't know Hebrew find it hard to imagine reading a language without vowels. Yet young children master it easily and adult students of Hebrew also find it not terribly challenging after some study. However, there are still some occasions where I end up misreading a word due to the lack of vowels. I first thought it meant that "every third coin (grush) escaped alimony". Only after a second reading did I realize that it meant "every third divorcee (garush) avoids paying alimony". For some reason this root - גרש - leads to occasional misunderstandings, and that's what I would like to explore today. The Hebrew root גרש means "to expel, to drive away". An related meaning is "to divorce". Divorce is gerushin גירושין and a divorcee is a garush גרוש. The connection between expulsion and divorce led to some humor during the protests over the Gaza disengagement. A popular bumper sticker read: יהודי לא מגרש יהודי - "A Jew does not expel another Jew". But someone read the sticker to me and said, "I thought it was the Catholics that don't divorce..."
וממגד תבואת שמש וממגד גרש ירחים "With the bounteous yield of the sun, and the bounteous crop (geresh) of the moons"
from M.Fr. apostrophe, from L.L. apostrophus, from Gk. apostrophos (prosoidia) "(the accent of) turning away," thus, a mark showing where a letter has been omitted, from apostrephein "avert, turn away," from apo- "from" + strephein "to turn"
Don't confuse Hebrew gersayim and merchaot - they have different meaning, different uses, and when using high quality typesetting - look differently. 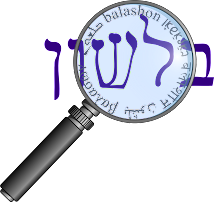 Gershayim is used for acronyms. Merchaot is used for quoting sentences. Similarly, geresh and single quotes aren't the same thing. Geresh is used for abbreviations, single quotes are just a typographical variant of merchaot (used when you have merchaot inside merchaot, for example). So geresh is used only to break up a word or indicate an abbreviation. Therefore apostrophe is an appropriate translation, and perhaps the etymology is the same. I'd be happy to hear from anyone who can confirm (or deny) this theory. The word is adopted from Latin (Denarius) Grossus: lit. "A thick coin" where grossus being "thick"
You can find additional discussion about the nature of the term grush here.